At this time of year, woods can seem a bit ‘naked’ and empty. Trees and shrubs have entered into a dormant state in order to survive the rigours of the winter months, their buds await the signals that herald Spring. Many birds will have migrated to warmer climes, some animals will be hibernating, many insects will be spending the winter as eggs or pupae, whilst herbaceous plants will over-winter as seeds, corms or bulbs. However, on the bark of many trees and on the surfaces of fences and walls, there will be lichens – they are there summer, winter, spring and autumn. 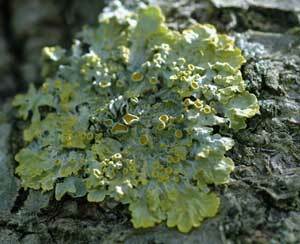 Lichens are rather unusual in that they are an amalgam of two organisms : a fungus and algae. They are symbiotic systems, where two partners work together for mutual benefit. The fungus makes up the bulk of the lichen’s structure (known as the thallus), but the algae (or cyanobacteria) are essential as they can photosynthesise and provide the organism with carbohydrates. 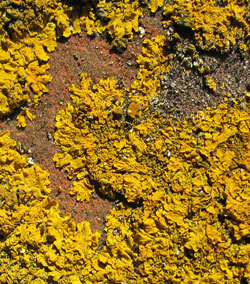 Lichens come in an amazing variety of shapes, sizes and colours – there are about 30,000 species worldwide. Some grow in extreme environments such as the rocky summits of mountain ranges, growing slowly, and live for hundreds of years. 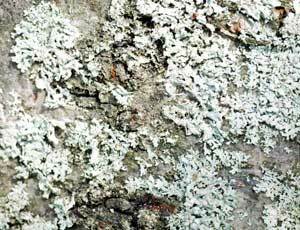 Lichens can tell us much about the ‘health’ of our environment, as they are sensitive indicators of pollution. In the 1950s, 60s and 70s many lichens died due to the high level of sulphur dioxide released from domestic coal burning and industry. Nowadays, nitrogen compounds (from traffic and intensive farming) are more likely to be the problem pollutants; these too can alter the growth of lichens. I am loving seeing all the new lichens and stuff this year – in the past we always thought of woods as dead in the winter, now that we have one, we see so much wonderful life! and yes, bright yellow, red, green stuff growing everywhere!